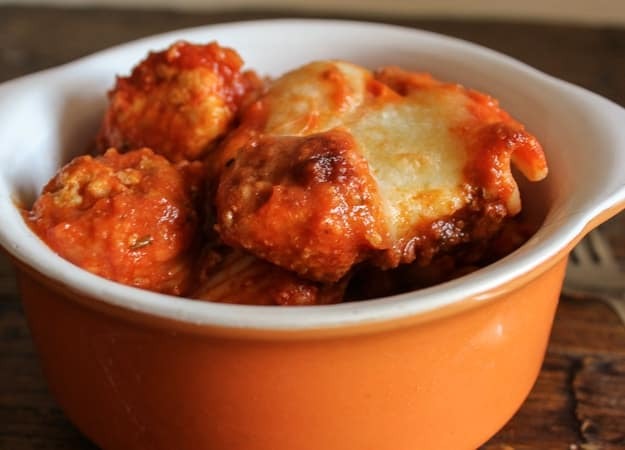 Mini Turkey Meatball Easy Baked Pasta Recipe, the perfect baked pasta recipe, fast, easy and delicious. Well I don’t know about you but we are back to rain and jackets again. I know in a month or so I will be complaining about how hot it is and how I can’t stand it, and how the heck am I going to last until October? Of course then I will start on how I can’t handle that it is always raining and how I am freezing to death in the house and so the cycle starts! Oh well, for now I will bake a delicious Mini Turkey Meatball Cheesy Baked Pasta and be content while we wait for the rain to end. This is a fast and easy baked pasta recipe that comes together quite quickly even though you may need a couple of extra pots. 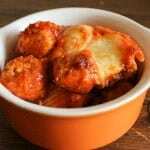 Perfect turkey mini meatballs cooked to perfection in a delicious homemade sauce, no bottled sauces in this kitchen please. Toss with cooked pasta, fresh mozzarella and topped with a good helping of freshly grated Parmesan cheese. I love when friends of ours or friends of my kids come over for lunch or dinner because then I really get into cooking and baking mode. My youngest daughter’s friend really appreciates my cooking endeavors, even if they have to wait a couple of extra minutes while I take a photo or two. But she tells me the wait was worth it. 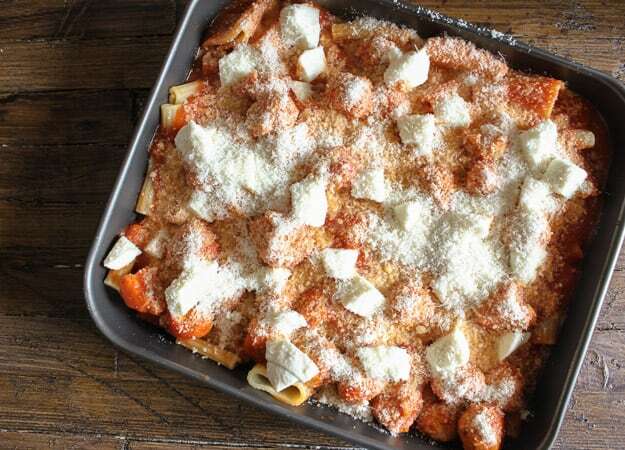 So if it is still rainy and cold where you are or even if it isn’t this Easy Baked Pasta Recipe would be a tasty end to the season of comfort dishes. Buon Appetito! 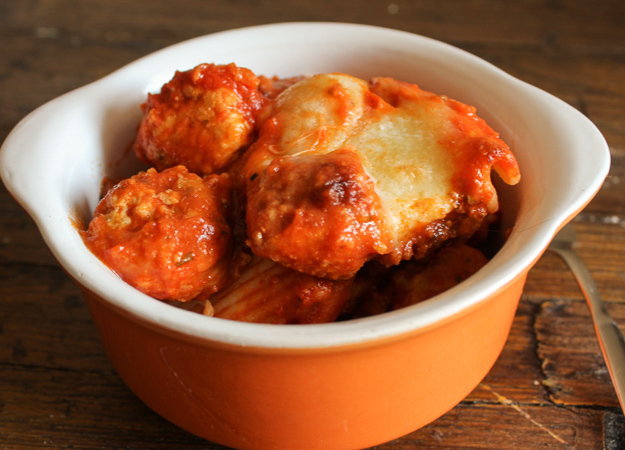 Mini Turkey Meatball Cheesy Baked Pasta, an easy baked pasta, yummy and deliciously cheesy. 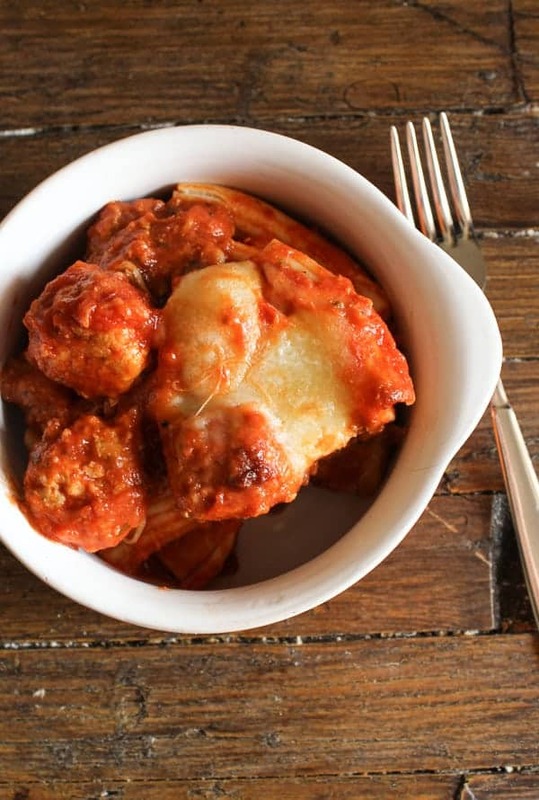 The perfect Italian comfort dish. In a small bowl soak bread in water for 2 or 3 minutes, then squeeze out moisture and crumble. In a medium bowl combine bread with remaining ingredients and mix well. Form into very small balls. 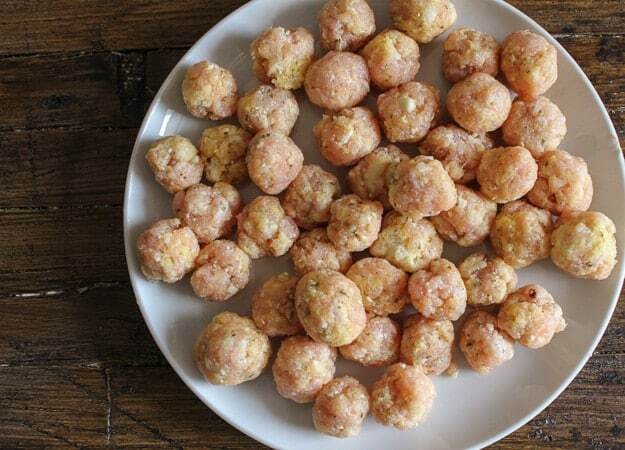 In a medium frying pan add 2 tablespoons of olive oil and brown meatballs on all sides. Drain before adding to sauce. While meatballs are browning, in a medium pot add all ingredients for the sauce, stirring until well combined. Add browned meatballs. Over medium heat, heat to boiling, then lower heat to medium low and simmer for 20 minutes (covered), than raise heat to medium, (leave pot slightly uncovered 1/3 uncovered) and cook an additional 15-20 minutes, until sauce has thickened. **In the last 15 minutes of cooking the sauce, pre-heat oven to 350° (180° celsius) and cook the pasta al dente (cook a couple of minutes less since the pasta will also bake in the oven). 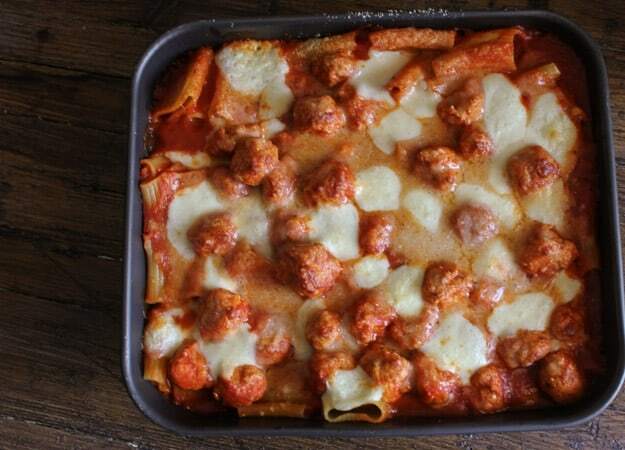 In a medium - large baking dish add well-drained pasta and thickened sauce, mix well to combine. Top with diced mozzarella and then parmesan cheese. Bake for approximately 20 -25 minutes in a preheated 350° (180°) oven. Enjoy! Yum!! It looks wonderful. To me the kitchen is the heart of the whole house and not matter how many times we have family or guests and we’re getting the last minute things together we are in the kitchen talking about —–FOOD! I will definitely make this recipe. Grazie!